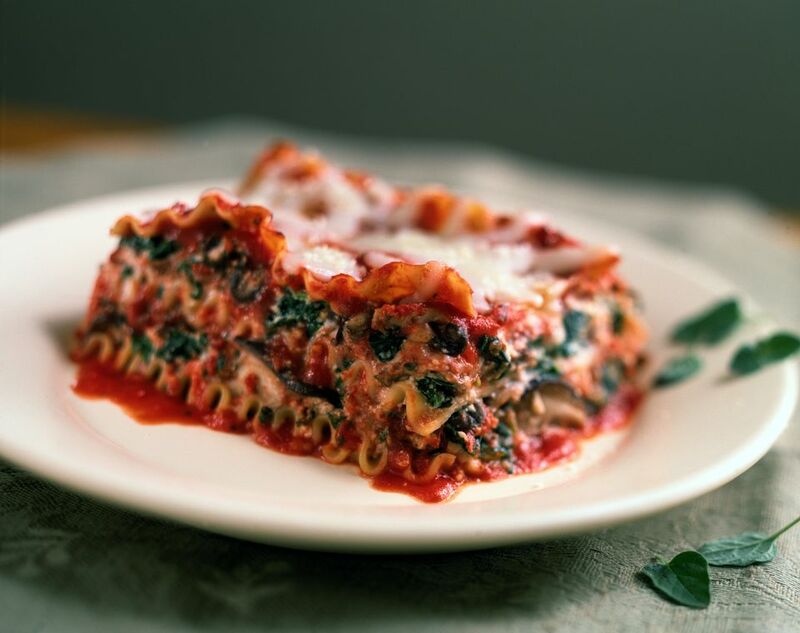 You may think of lasagna as a fattening comfort food, but you will change your mind after trying this version from the "The Carblover's Diet Cookbook." It uses ricotta, mozzarella, and Parmesan cheeses as well as turkey to cut down on the fat content and calories. Spinach adds color, flavor, and fiber. You may use jarred marinara sauce from the market or your own homemade. Use whole-wheat lasagna noodles to boost the fiber even more. Serve with a side salad to round out the meal. Recipe reprinted with permission from The CarbLovers Diet Cookbook (Oxmoor House). Heat olive oil in a large high-sided skillet and cook onion, stirring occasionally, until softened, 6 to 7 minutes. Add garlic and cook 1 minute. Add turkey and cook, breaking up with a spoon, until no longer pink and cooked through, 4 to 5 minutes. Add marinara, bring to a boil, reduce heat, and simmer 2 to 3 minutes. Remove pan from heat and cool slightly. Combine ricotta cheese, spinach, parsley, egg whites, salt, and pepper in a large bowl. Coat the bottom of a 14- x 11-inch lasagna pan with 1/2 cup sauce. Arrange three lasagna noodles on the bottom of the pan. Spread 3/4 cup sauce evenly over noodles. Spoon 2/3 cup ricotta-spinach mixture evenly on top of sauce. Repeat layers two more times. Cover top with three noodles and remaining 3/4 cup sauce. Sprinkle with mozzarella and Parmesan. Cover loosely with foil and bake for 45 minutes. Remove foil and bake 10 to 15 minutes, until cheese is bubbly. Cut into squares and serve.